Me and my family, including my husband, our 2 small children, and our lovely dog, have just returned from a week in my favorite part of Tuscany; the enchanting and idyllic countryside south of Siena, an area known by the name of Val d’Orcia Valley, from the name of the beautiful river crossing this extraordinary natural park. That’s the fantastic place in central Tuscany I mention very often in the blog, I love it! A journey to Tuscany would be incomplete without a visit to this beautiful land, that, fortunately, has remained largely uncontaminated. 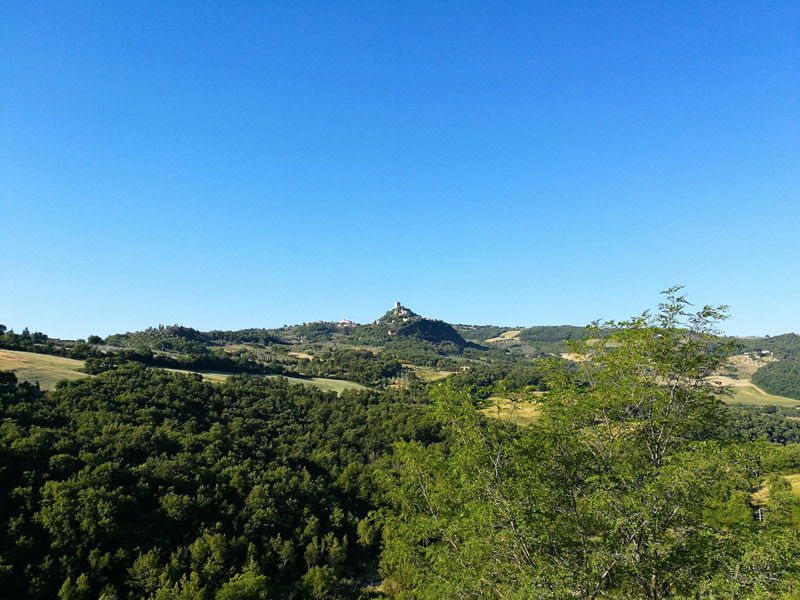 In case one is visiting Tuscany not just for 1 or 2 nights, I always recommend exploring this fascinating territory… be sure that’s worth the visit! Here you can find all that distinguishes Tuscany from the rest of the world 🙂 landscape, views, art, history, legends, thermal baths, food, wine. The Val d’Orcia Park is an artistic, natural and cultural park, recognized as a UNESCO World Heritage Site thanks to the incredible beauty of its unique and breathtaking landscape and its Renaissance artistic heritage. After the Chianti, it is probably one of the most famous territories of Tuscany, for its hills embellished by tall and solitary cypress trees, vineyards, fairytale villages and palaces, but especially for its incredible wineries, mainly in Montalcino. The wonderful hill town of Montalcino is where the prestigious Brunello di Montalcino red wine comes from. Like many other medieval villages of Tuscany, located on the Via Francigena, Montalcino lived a long period of peace and prosperity, that allowed the construction of beautiful churches, imposing fortresses and mystic abbeys. East of Montalcino is Pienza, probably the most beautiful destination of this magic land. This characteristic hill town is itself one of the UNESCO World Heritage Sites, and is notable for its cultural, historical and artistic heritage, for its splendid religious architecture, and also for its delicious pecorino cheese…from which incredibly delicious dishes are prepared. All here is perfect, from historic palaces and panoramic gardens to lovely piazzas and romantic streets, and of course food! The place I stay almost all the times cause I’ve fallen in love with, is the tiny, quaint, and absolutely unique village of Bagno Vignoni, that has become quite popular during last years, though many still ignore it! This little borgo is made absolutely unique in the world as the ancient thermal pool dating back to the glorious Renaissance times is actually the village’s main square…so you walk all around it admiring the its beauty from any angle. You cannot bath in it, but you can enjoy these healing hot waters in one of the 2 very good hotels in the village, one right facing the piazza. All the countryside south of Siena can be defined as magical in many ways; staying here and admiring all that is beautiful is such a relaxing experience! …. from scenographic landscape, imposing castles, ancient hill towns, to incredible food, delicious wines and scenic curvy roads…. Hi Elena, we had a superb holiday in Umbria in September this year and would like to visit Tuscany next year. We spent 10 nights in Umbria . We visited Florence, Pisa, Siena and SAN Gimignano 24 years ago and won’t mind revisiting. Would you say an 8-night stay will allow us to see all the must see places and would you say early July is preferable to end July? Also should we stay in one hotel or use two hotels as our base? We’ll be flying from London. And there are 2 couples travelling together. We’ll hire a car. Most grateful for your advice.